Is The Clock Ticking For Danica? So far Danica Patick’s “rookie” season in the Sprint Cup level of racing is extremely disappointing! At Talladega, where she was sometimes in the thick of the front draft, there was a problematic pit entry with 20 laps to go and a lap lost on the subsequent drive through penalty. It was a rookie mistake, perhaps, or maybe another driver’s fault. Yet, both are explanations that pale by comparison. Fellow rookie Ricky Stenhouse Jr. also made a mistake which involved another driver – while trying to win the race on the last lap. The comparson to Stenhouse Jr. is an obvious one, given that he is Patrick’s boyfriend, as well as rival for the Sprint Cup rookie title. As comparisons go, it might be a less than apples to apples. Stenhouse Jr. has been driving stock cars a few years longer in his racing career, while Patrick competed professionally in open wheel machinery from the age of 16 until she was 27 years old. If Patrick, now 31, fails to make the transition to the Sprint Cup from Indy cars, she would hardly be the first in recent years. 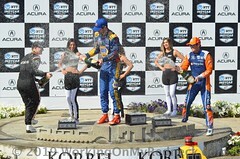 The list also includes Indy car champions and Indy 500 winners Dario Franchitti and Sam Hornish Jr. Yet, from the perspective on the plains of Alabama, Stenhouse Jr. looked a lot better, even if his 185 mph collision with, ahem, rookie Austin Dillon (also in a Stewart-Haas Chevy) brought out the fateful yellow flag that decided the race. Those guys were running third and fourth at the time of the incident, two miles away from the checkered flag. Patrick has always been at her best on high speed ovals, the Indy 500 being the origin of “Danica Mania” in 2005 when she almost won the race in her first try. It made sense for Patrick, long since a media phenomenon, to move to NASCAR in part because there are more high speed ovals by comparison to IndyCar, which employs winged cars with high downforce, that she acknowledges are difficult for her to drive on road and street courses. There’s also a heck of a lot more money and much more media attention in the Sprint Cup. Patrick’s opportunity, of course, comes from her ability to bring, or generate, sponsorship for her team owners. 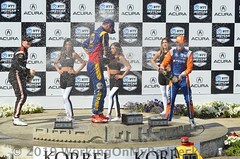 It also bears mentioning that others have brought money into the Sprint Cup in order to get an opportunity. Paul Menard, for example, has been backed by his father John Menard’s (who is worth more than a billion dollars) family business at the Richard Childress Racing team. It is very nice to have a father, owner of Menard’s, who has endless depth in his financial pockets! Lo and behold, Menard finished third at Talladega as a result of the crash involving Stenhouse Jr. and Dillon on the last lap. Nobody has ever accused Menard of balloon-footing, so it’s no surprise that he was running up front at Talladega, especially since he’s been a winner in the Sprint Cup at Indy. Patrick is running out of excuses! In effect, Patrick is running out of good reasons for not finding a way to run closer to the front of the pack, especially when it comes to intermediate tracks or superspeedways. The pit road incident at Talladega aside, the cumulative work of Patrick this season does not measure up well by comparison to Stenhouse Jr., even if the short tracks are thrown out. The plate races at Daytona and Talladega are by her own admission Patrick’s strongest suit. 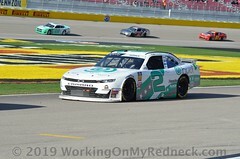 Yet, in her second year of running plate races in the Sprint Cup, Patrick did not lead a lap at Talladega while Stenhouse led four times for six laps. Patrick occasionally made it into the Top Five, but there were no ventures into the lead. Then came the high-speed pit road entry in the grass with 20 laps to go. If the problem is not getting a break from other drivers, I would suggest that running at the front solves a lot of these types of issues. If she feels that she gets no respect from the other drivers, the issue of respect is earned, not given! If problems with other drivers ensue at the front instead of in the pack, all is ultimately forgiven when it comes to racing passion – such as the scenario with Stenhouse Jr. and Dillon. As I have often stated; Danica is selling her brand, her image, and her good looks. She is a good looking female that drives a race car. Nevertheless, she has the full confidence, and financial backing, of big dollar corporate America, specifically GoDaddy.com. Therefore, the NASCAR team owners will welcome her into their racing stable. That is, just as long as the huge dollars follow. That is, unfortunately, the business part of this sport. 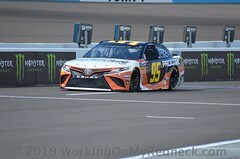 However, sooner or later, the knowledge that she will not be a Chase contender, nor a race winner, as well as not a viable championship driver, and that will affect the big dollars that she presently has backing her. When that time does come, her plight will take a drastic downturn. 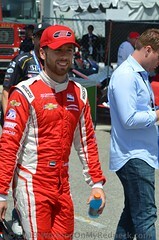 How long can the good looking journeyman race car driver keep bringing in huge sponsorship dollars from corporate America? 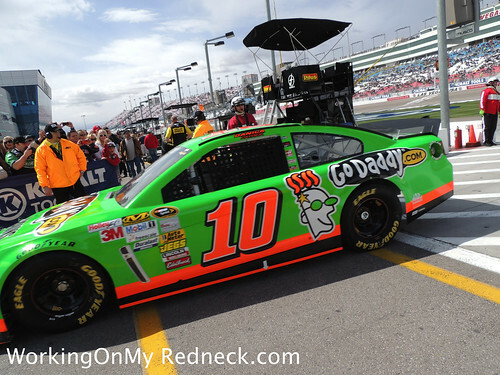 More specifically, how long will GoDaddy.com keep pouring money into the Danica coffers? It would appear that GoDaddy can statistically prove that there is a return on their investment of Danica Patrick. But one would think that this particular “gravy train”, GoDaddy.com, might soon cut off the, seemingly unending, flow of sponsorship dollars to Danica when the return on their investment falters. I think that after the 2014 season, there may be a change of heart at the Stewart-Haas Racing camp, regarding their affiliation with Danica Patrick. Previous Article McMurray Survives Talladega!